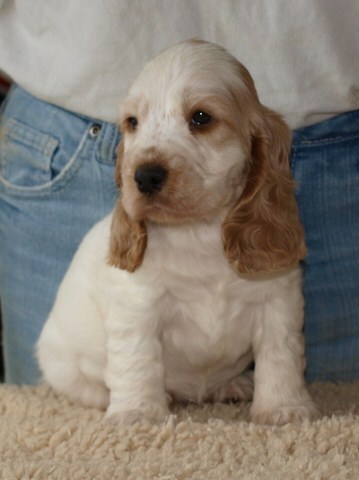 Puppies of Heggelia and Leaky grow well. 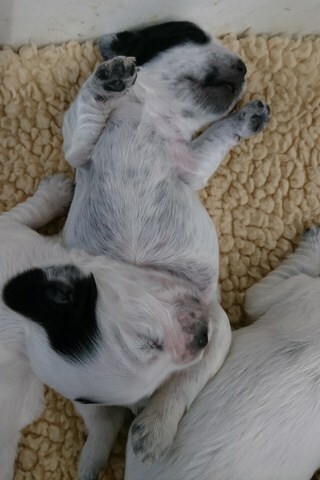 They are now one week old. They had their first photo shooting, to discover on their page. 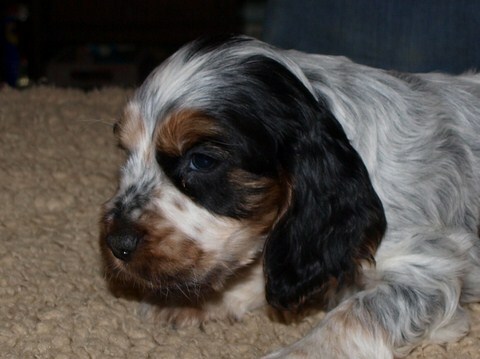 Well, it's time, puppies of Halenia and Leaky are ready to go ! 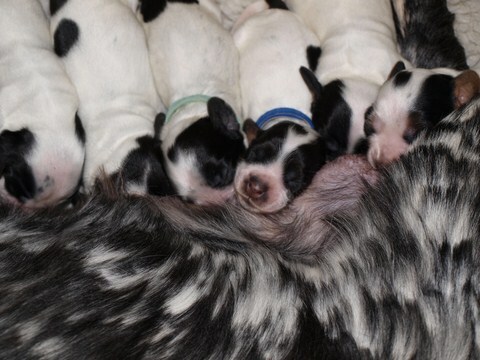 They have seen osteopath, they have their vaccine, and Mum prepare their bag ! Five of them will leave next weekend ! We had to go to the dog show of Le Mans this sunday, but a setback had prevented us. Nevertheless, the Marellek were present ! Men'hot was Very Good in a beautiful young class and Leitha was a pretty 4th Excellent in a raised open. Proud of girls and of their owner, Baptiste Delahaye. This weekend, it was great leaving ! 4 puppies of Halenia and Leaky have joined their new family : Nenna (renamed Nalla), Nessy, Naya and Noukka have taken the road, sometimes for long hours. Long and beautiful life to you my babies ! This weekend meant leavings ! On Saturday, Nuxalk left (finally !) near Paris. 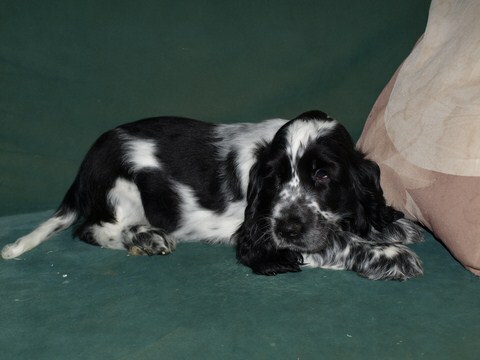 On Sunday, Nisa joined her family in Morbihan, she was waited for a long time ! Manda left in Morbihan too. Long and good life to you three, my babies ! New photo shooting for Harmelle and Leaky puppies, to discover on their page. They are well growing, they all weigh more than one kilogram now ! And now, they are playing together, they are trying to bark, they are claiming mom Harmelle, and they are going out of the box, it's funny ! On last sunday, it was the day of delegation of Normandy of SCF. We have met with a lot of pleasure our friends of Britany and Normandy. 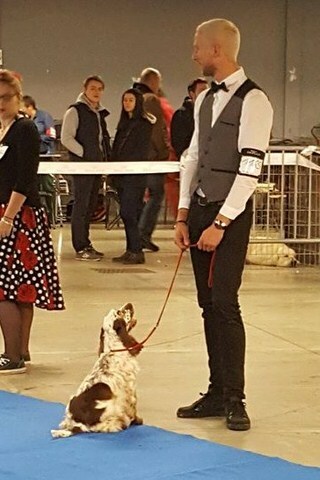 I have engaged no dog in the initiation field-trial but I was lucky, I have played quary fitter for our judge and so I could hear with a lot of interest advices provided by Mr Feyler. On dog side, well, they did the job ! Moorea and Maalouf success their TAN, Mabea success her TAN and was confirmed. 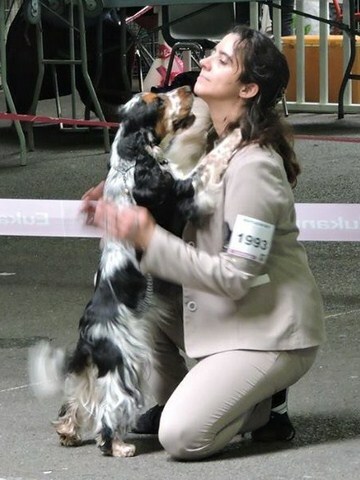 Another Ar Ti Marellek was here, Mako (sister of Maalouf) : she obtained the best TAN of this day and is qualified for the final on November 4th, she was also the best cocker of initiation field-trial !! It was a great pleasure to see her and a pretty pride of breeder, very thanks to her owner for the work doing with her and for engaging her in this type of day ! At Haren, her two daughters have found their future home ! They will leave in September and Ocotber. 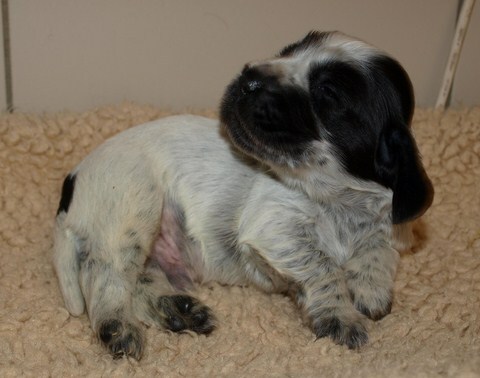 So there is no puppy available on this litter. 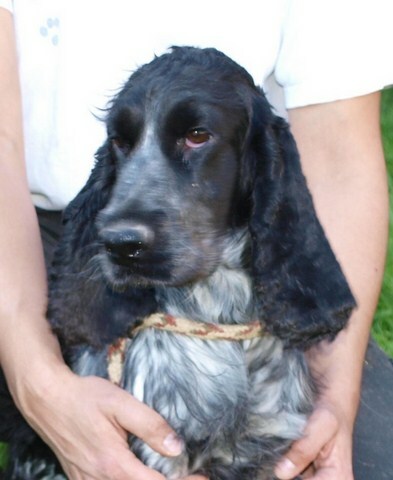 Naarden, almost 3 months old, is always available, as well as Nuxalk, 5 months and half old : I have finally choosen, and it's his brother Navajos who stay at home to take over from their father El Hobo. Booking possible now, a girl will stay at home. 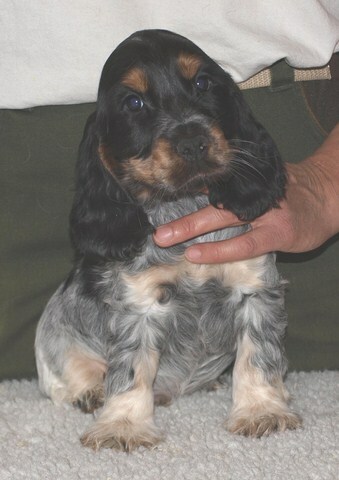 Puppies of Haren and El Hobo are now 6 weeks old, already ! They have seen veterinary for the microship implantation and have now their name, to discover on their page... And we have done too a little osteopath control, it was not for nothing, like always... The two girls are always available for booking, they could leave the kennel since September 9. Don't hesitate to ask ! On the olders side, Naxos (Grace x Leaky) has finally found his family ! He will leave next week ! Two leavings last weekend, Nacka joined the Ardennes and Nadela the Morbihan. Long and beautiful life to you two, my loves. 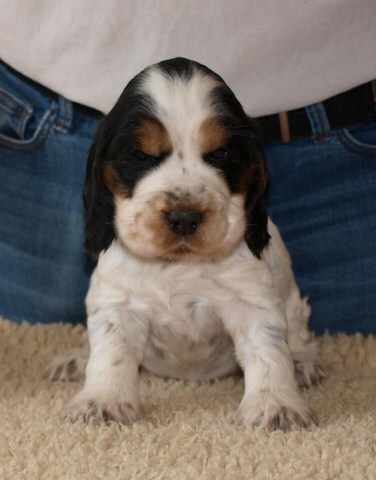 Always some available puppies and others to reserve, price of oldest has decreased, as well as that of Naarden (in picture, 2 months old, son of Gloria and Leaky) because he's not available for breeding (testicles not in place). In late July, reservations are coming ! Nacka and Nadela, the two daughters of Gloria and Leaky, have found their family, which they will join next weekend. Their brother Naarden has perhaps found too, we expect a confirmation on tomorrow wednesday. A little late to update the website, it's because of a lot of working at kennel ! 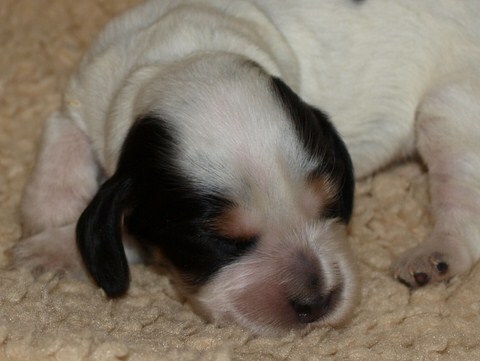 On puppies side, Nabao, Nova and Milka, Junon's children, are joining their new families. 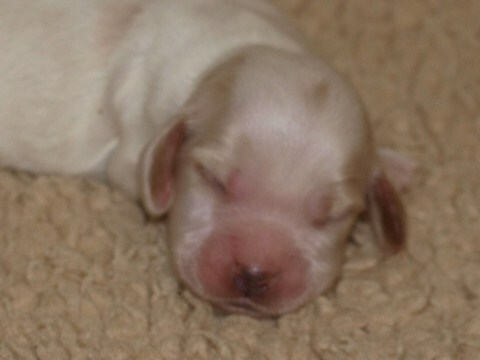 The last of the litter, beautiful Narcéa with wall eyes, will do the same this next weekend ! 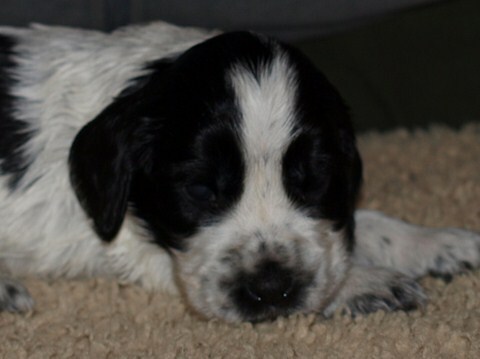 And the two girls of Haren, 12 days, ready starting September 7. 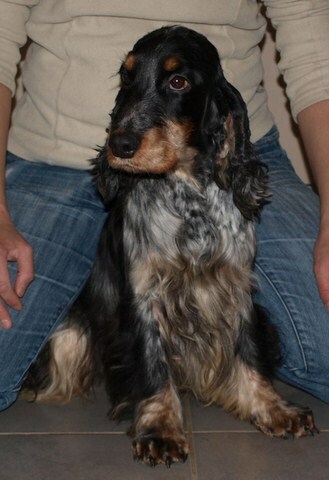 Liry (born Labiou, son of Idylle and Hoon), 2nd excellent RCACS in open class, for his first dogshow ! 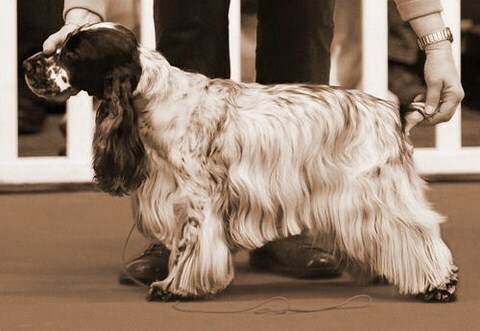 Moorea, 1st excellent CACS and Best of Breed ! 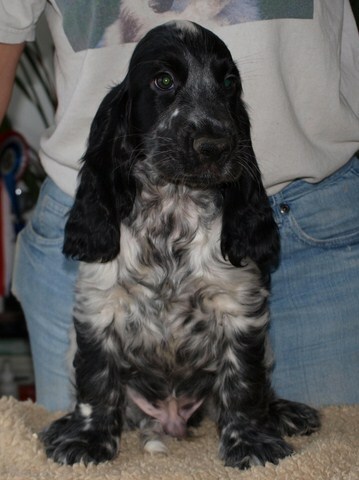 Billy (born Myèné, son of Lady and Buzz), 1st excellent and Best of Breed Young for his first dogshow ! During this time, those of Junon continue their explorations outside, and their games with the cat ! They met the osteopath for some little checks, and will meet again the veterinarian for vaccines at the end of this week. The Marellek were nevertheless present in Nantes : Men'hot (daughter of Lady and Buzz), owned by Baptiste Delahaye, finished 2nd Very Good of young class, and Inès (daughter of Dora and Snow), presented by Séverine Cottebrune, finished 2nd Excellent of open class. Bravo to both of them, as well as to their owners and handlers ! And at the kennel, we didn't idle ! 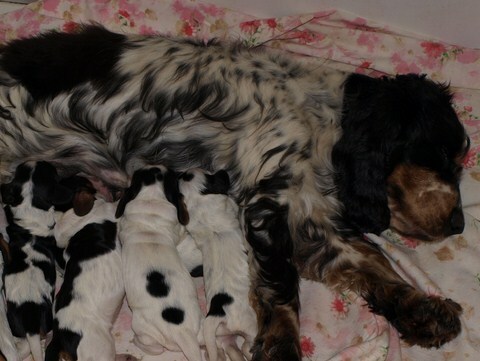 Gloria gave birth to the fruits of her lovestory with Leaky : saturday morning, 5 pretty puppies joined us (in picture). Unfortunately one of the little females does not seem able to survive because of its fragility... 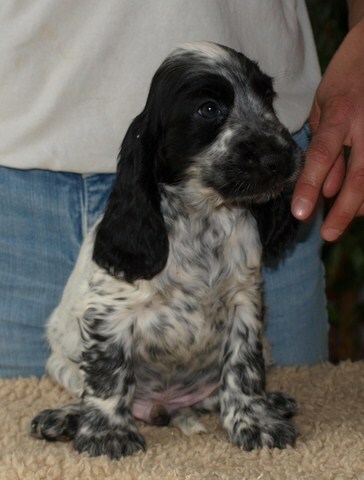 So we will have 2 blue boys (one in booking), 1 black and white girl (or very light blue) and 1 orange and white girl. 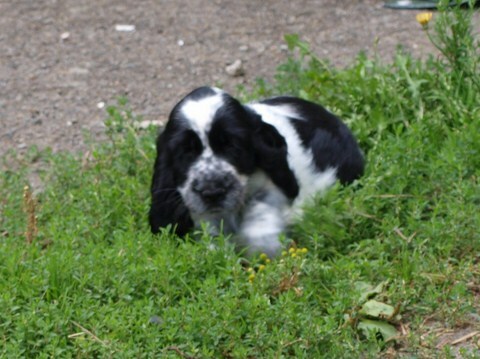 Junon's puppies were chipped saturday morning, everyone is doing well and has been very wise. 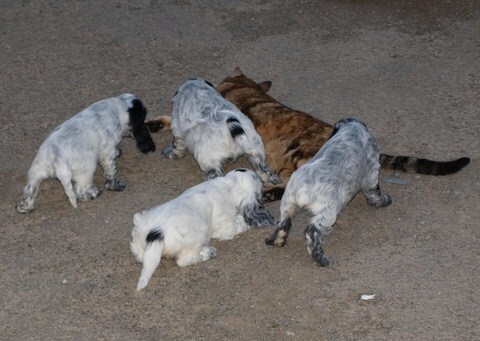 They now eat dry dog food because of the worries of udders of mom, but no worries, it goes well done ! We were on may 25 in the show in Evreux. 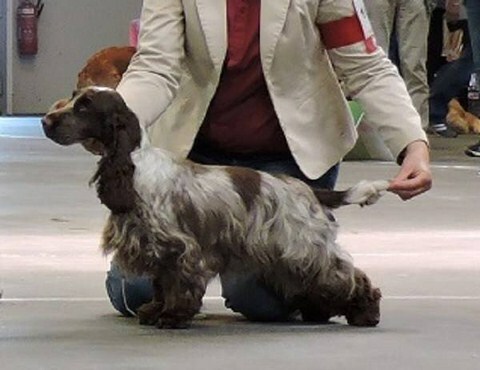 Leaky, for his first open class, finish 2nd Excellent, and Mabea, in young class, finish 1st Very Good, her stress costing her the excellent because of her moving. 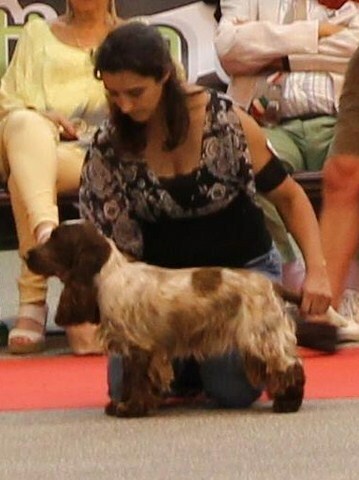 Super comments of the judge for the two dogs, Leaky is judged still young in his construction, Mabea must relax in order to put herself fully in value ! 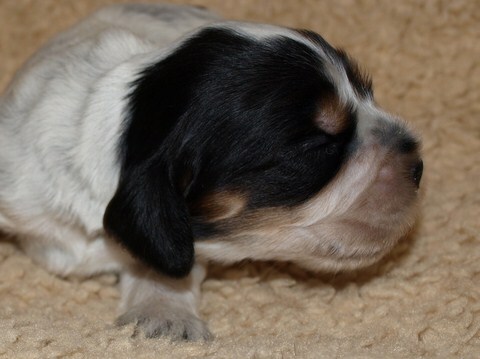 Puppies of Junon and El Hobo grow well, they are now 3 weeks old and begin to discover the world. Photo shoot for them too, still available the blue boy and the black and white girl (which will be speckled with small blue dots like many of children of El Hobo !...). Big activity at the kennel this weekend ! On saturday, Natchez, Nesquik and Nakoma have joined their new family ! 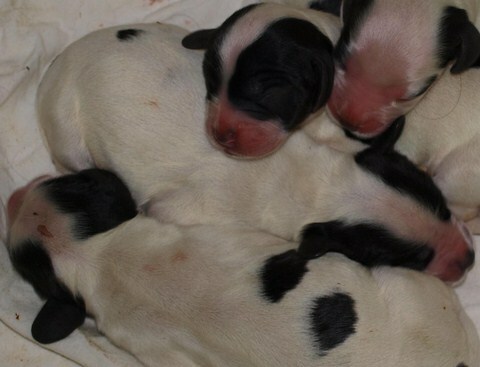 "The birds leeave the nest", Goria's puppies are now "great"... Long and beautiful life to them, I will have the chance to see them again and I am delighted !! 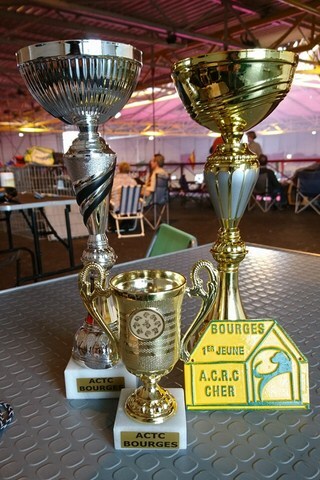 On sunday, we were at Rennes dogshow, what results !! And above all, Moorea, 1st Excellent in young female class, confirmed, Best of breed young, Best of group young !! 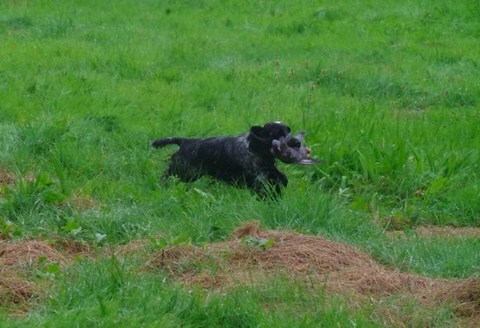 Very proud of my dogs, who were very well behaved, while it was the baptism of fire for two of them. Happy to have seen friends, colleagues and clients, it's always a pleasure to discuss with all of you. 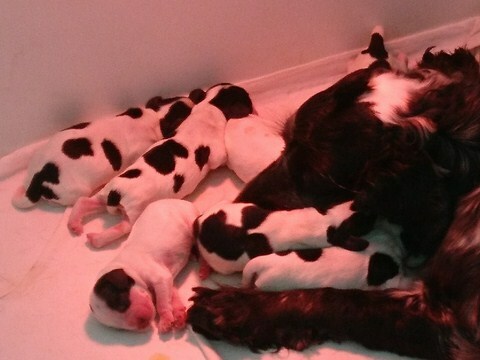 April 26th, Junon gave birth to 5 puppies, but one of them unfortunately left us. Daddy is El Hobo. The four alive are in great health and grow in sight ! A black and white boy, two black and white girls and a blue girl (reserved) make up this very clear litter (shortage of black paint ??). Booking possible now, individual photos will be taken this weekend to introduce them to you. Gloria has been scanned and she's pregnant after her lovestory with Leaky ! 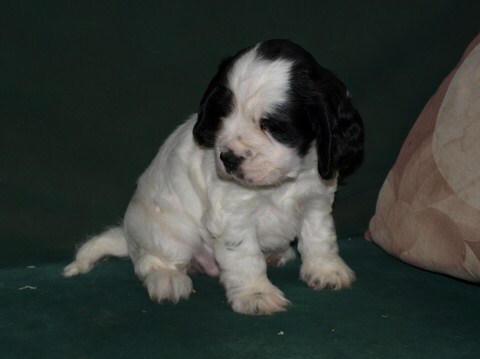 Planned birth early june, blue puppies, black and white, orange and white, and perhaps tricoloured, expected, they will be NF and APR clear, beauty and hunting lines. Natchez (Goria x El Hobo) found his family this sunday ! 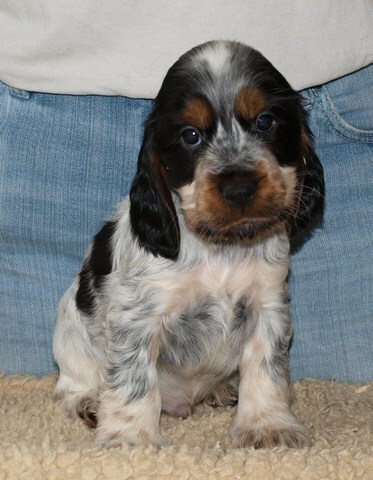 He will join his 4 "little human brothers" at the end of May, it promises to play games ! 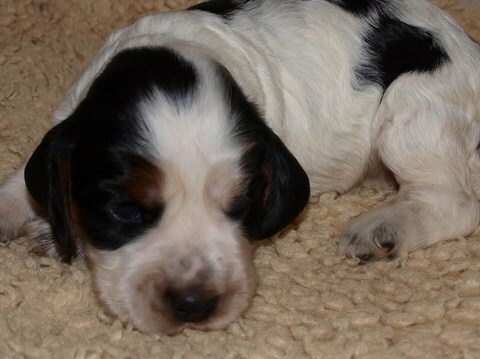 Naxos and Namorik, tricoloured boys, born in Grace and Leaky on march 22, available from may 24. 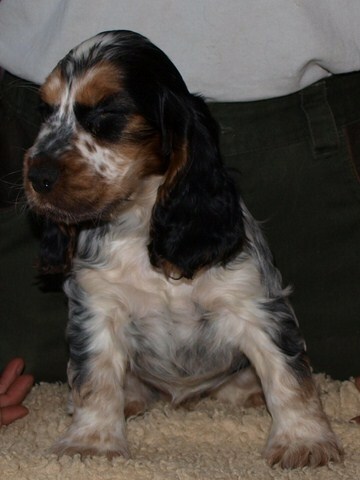 Puppies of Goria and El Hobo are now 5 weeks old. For this occasion, they went for the first time to the veterinarian, for the microship laying, and they had a new photo shoot ! To discover on their page... 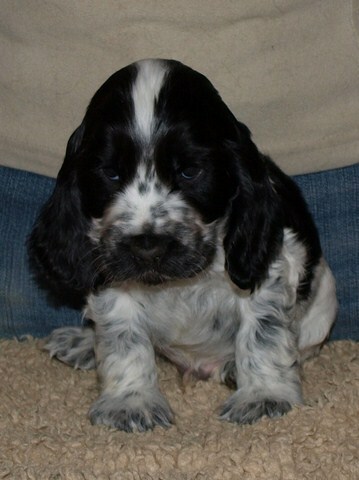 There are 4 available boys on this litter : 3 blue and 1 black and white. 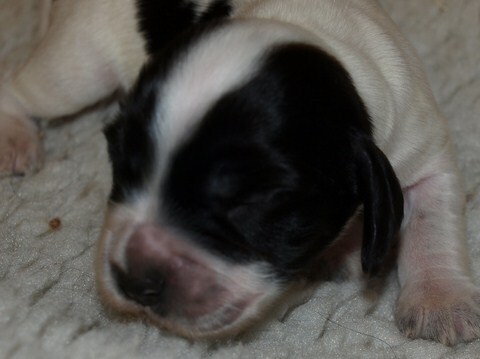 Those of Grace and Leaky are 3 weeks old : they start playing and tasting mom's food ! 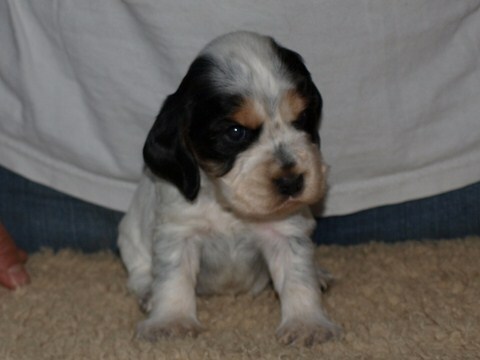 There are 2 tricoloured boys available. A birth... but no puppies ! 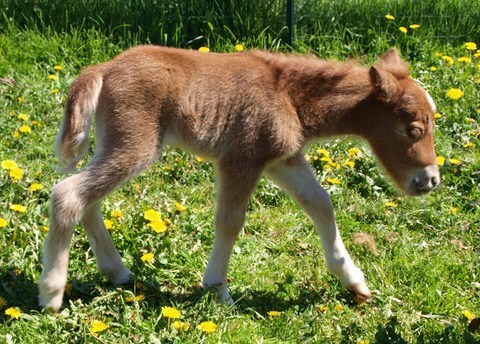 Saturday, we had a new birth, but this time, it's a nice filly who was born ! The daughter of Queen and Opium is already strong and full of life, it's a nice little Sorrel who will be available to its weaning, in 6 months approximately. Booking moving ! 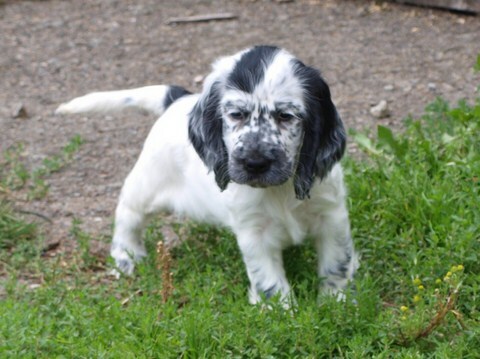 It is currently available : 1 black and white boy and 3 blue boys (Goria litter), 1 tricoloured girl and 2 tricoloured boys (Grace litter). Don't hesitate to inquire ! Contact page or phone - (+) 33.6.79.84.65.55 - or email ar.ti.marellek@gmail.com, answer assured ! In other news, my pretty Junon is pregnant of El Hobo ! Confirmed pregnancy and birth expected around April 30. 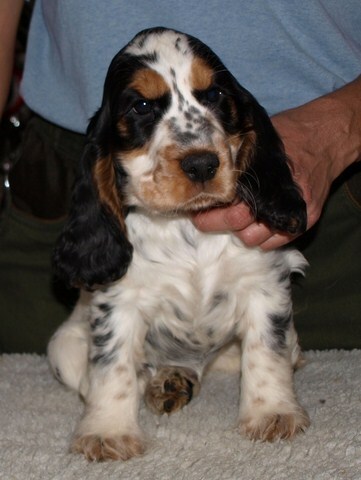 I expect cuddly puppies, with energy, color blue or black and white. 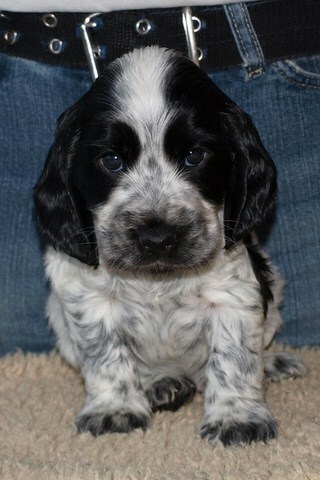 Can't wait to see the little faces ! 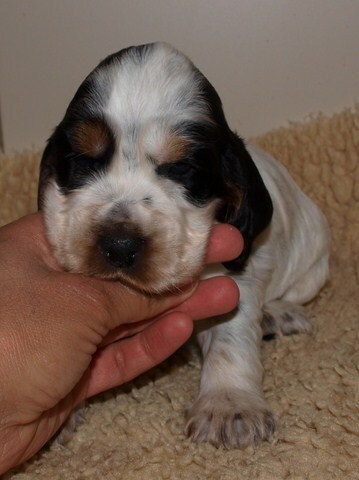 The puppies of Goria aand El Hobo are now 2 and a half weeks old (already !!). The eyes are open, they begin to play together. They are fat like little pigs, mother's milk is nourishing ! So we did a new photo shoot, to be discovered on their page. 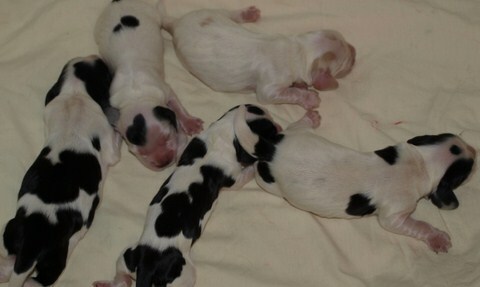 The puppies of Grace and Leaky were born on wednesday, March 22th. 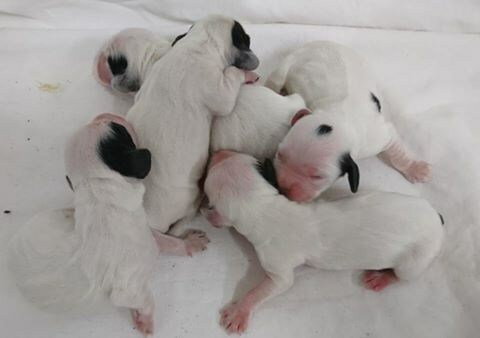 They are 7, all tricoloured, 2 boys and 5 girls. Everyone is doing well and mother is watching her offspring ! We were this weekend in the National Club Show and CACIB dogshow of Montluçon. 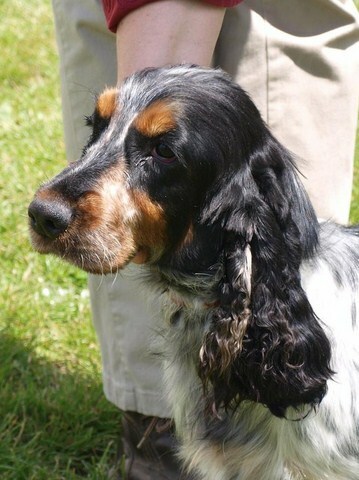 If Leaky was not decided and only shone by his hugs, Moorea was a nice surprise, ranking 3rd Excellent at the National Club Show on saturday and 1st Excellent at ths special dogshow on sunday ! Good girl ! First 2017 puppies have arrived ! 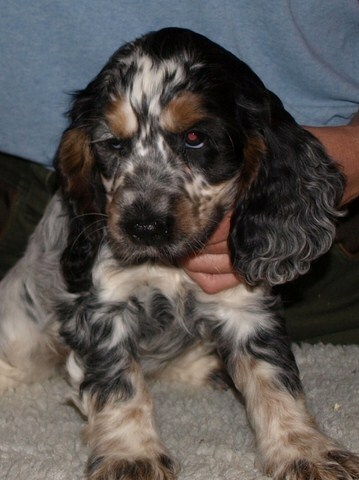 and Manda 2nd Very Promising in puppy class for her first dogshow. It's the end of holidays ! After a particularly quiet period, the activity of the breeding takes off !! First, Gemena found her future home. 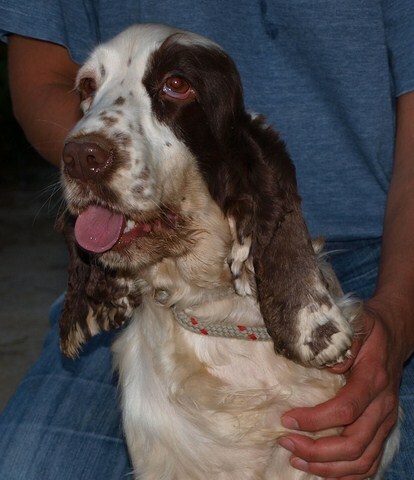 This beautiful 6 years old girl, who never wanted to give us puppies, she is now in retreat. She cracked her new family with a big hug. 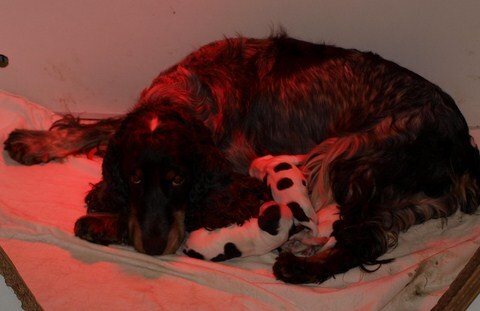 She will join them as soon as she is sterilized and recuperated. Great news, motherhood is going to fill again !! Goria has been confirmed pregnant today : more than three years after her first (and last) puppies, her marriage with El Hobo will give birth around March 15th to a beautiful blue litter. 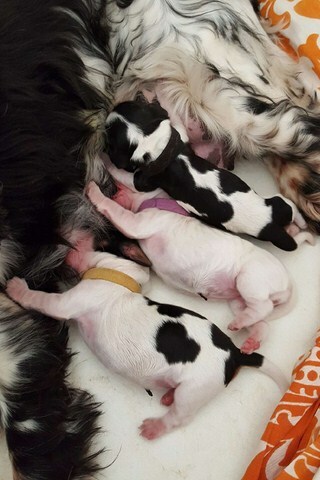 Dynamic and large-sized puppies awaited, beautiful instincts on the side of Goria, pups free of NF and free or carrier of APR. This time, that's it !, 2017 is well started !! Ar Ti Marellek wishes you an excellent year 2017 ! 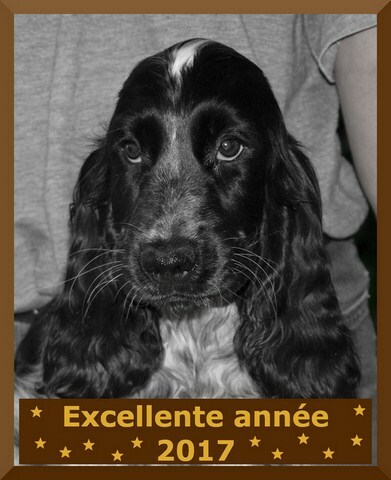 The 2016 news was rich for the kennel : many puppies were born and left in their family, our "old puppies" and our reformed of the year also found a new home, we participated in several dogshows with good results, this balance is overall very positive ! Well, we wish we will have a very busy year ! The girls are a little late to their heats but it restarts nicely and many beautiful marriages are planned this year again. 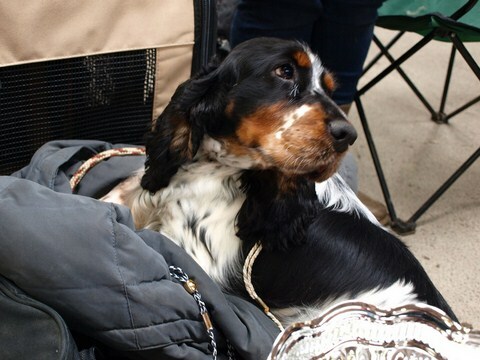 Our young dogs started out well last year in dogshow, so they will return with beautiful appointments in the program. 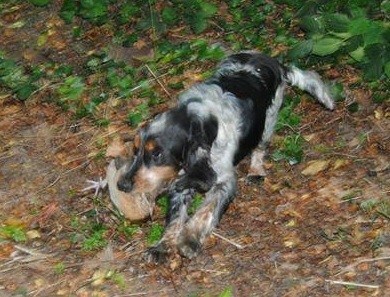 The return to hunting is also planned for some of them, hopefully this will result in field-trial outings this year. 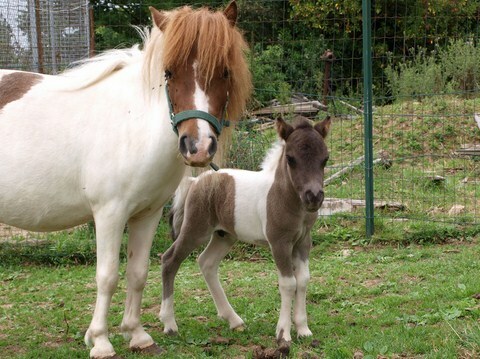 Let's not forget our ponies : after three years without birth, three pretty foals should be born this spring !